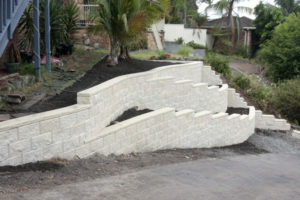 Creating Eden Landscaping build retaining walls and with our 20 years experience in Newcastle & Lake Macquarie will provide the right retaining wall for you. Our retaining walls can be built in sandstone, bush rock, masonry, timber, blocks, concrete and brick for any situation in homes across Newcastle and Lake Macquarie – we have built retaining walls at Merewether, Caves Beach, Jewells, Warabrook and Waratah to name a few. We are specialists at providing retaing walls at new property developments such as Fletcher and Cameron Park. So if you are looking for solid, attractive retaining walls built to last for your home then call Matt or Dan at Creating Eden Landscaping for your retaining wall needs.